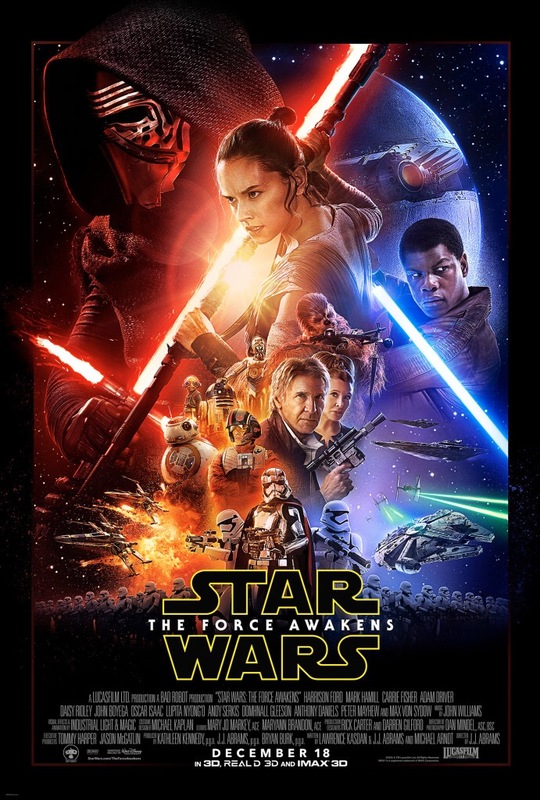 Mostly spoiler free review of Star Wars: The Force Awakens (3D). If you don’t want to know any names of characters who appear in this movie, you probably shouldn’t read it before watching it. Otherwise, you’re good. Fans have waited 10 years for the continuation of Star Wars. In my opinion, it was totally worth it. Although I am not one of the biggest Star Wars fans, I did enjoy watching the original trilogy as a kid and when re-watching it lately, I liked it still. I remember having seen the first prequel in the cinema – and I hated it so much that I never went back to watch the rest of it. I did watch the prequels last year (or rather suffered through them) and I choose not to watch them again. Then, we got the first teaser trailer for The Force Awakens. Is your heart beating faster already? ’cause mine is! This is what I have been waiting for. This teaser trailer promised me a movie that would make me want to believe in Star Wars again. After watching the movie, I was pumped. It confirmed and shot above my expectations. While there are certainly some things to criticize, my overall impression of The Force Awakens was very positive. Not only did we get our old heroes back – I am talking, of course, about General Leia Organa, Han Solo, Chewie etc. – but we also get brand new heroes to love. Rey, Finn and Poe take on the dark side and we are with them every minute of their journey. Rey is a character I would have loved to have around when I was a young girl. She is fierce, strong, independent and intelligent – but also loving and caring. Hers is the story we follow. She is our Luke. We don’t know much about her origin, but we know enough about her character and her abilities to love her and to care about her. Finn and Poe are both great in their own ways. Finn, is somewhat naive and does not understand the world that he lives in. Nevertheless, he shows strength, a kind heart and loyalty towards his friends that lets him overcome his own fears and insecurities. Poe, although he barely appears in the movie, is an excellent pilot who fights for what and who he believes in. He is also possibly the first queer protagonist we get in Star Wars (cinematically speaking). The movie itself is highly enjoyable. Even if you don’t care about diversity or gender issues (which you totally should, imo), you will have a great time. There’s heart, there’s humour, and there’re awesome battle scenes which will have you on the edge of your seat. The prequels made me very cautious about raising any hope for The Force Awakens, but I was completely blown away!! A lot of my friends argue that it was too much like A New Hope, but I thought it had enough elements of its own. I loved that they humanized the Stormtroopers (and we even side with one in Finn); beneath the sea of identical masks, they’re people too.